At least seven Iraqi children have died after their schools were caught up in a day of sustained violence across Baghdad and other parts of Iraq. A mortar hit a Baghdad high school, killing at least five girls, while a bomb blast hit a primary school in Ramadi, leaving two children dead. Fighting has meanwhile erupted near the holy city of Najaf, where a US military helicopter was reportedly shot down. 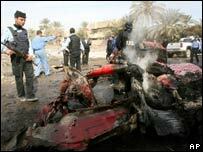 Police say 54 unidentified bodies were found in and around Baghdad on Sunday. On Saturday, police said 40 bodies were found - such deaths generally attributed to sectarian violence. The UN says that, on average, just under 100 people die through violence each day in Iraq. 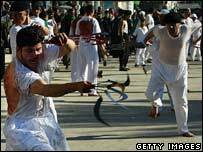 The latest violence comes as Shia Muslims mark Ashura, one of their holiest festivals. Pupils at a secondary school in the mainly Sunni Adil district in west Baghdad were taking a break from lessons when two mortars landed in the yard. Five girls were killed and 20 other pupils injured as the blast blew out classroom windows, spraying the children with debris and shards of glass. A girl aged about 15 told Reuters news agency that she had been hit in the legs. "I couldn't see much but what I saw was my friend Maha, who was lying beside me on the ground. "The shrapnel hit her in the eyes and there was blood all over her face... She was dead." Grieving parents flocked to the scene and wept as their children's bodies were placed inside wooden coffins. It was not clear who fired the mortars but the school is in a district which has been the scene of frequent reprisal attacks by Sunni and Shia extremists. A primary school in Ramadi, north-west of Baghdad, was caught up in the violence when a suicide truck bomber attacked a nearby Iraqi security base. 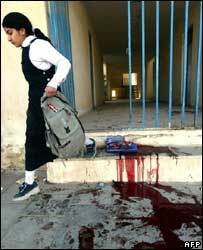 Military and hospital sources said two children and three guards at the base were killed, and 10 pupils were injured. The wave of attacks comes as Iraqi and US forces are gearing up for a security crackdown in a bid to halt the sectarian violence that is claiming hundreds of lives in Iraq every week. Intense clashes have been taking place in orchards outside the holy city of Najaf, as Iraqi troops backed up by US forces battled several hundred armed men, whose identity is as yet unclear. The provincial governor of Najaf said a US military helicopter had been shot down by what he called "enemy fire" in Zarqa, scene of the clashes, and Iraqi police were quoted as saying the two crew on board were dead. A Reuters correspondent reported seeing an American helicopter trailing smoke after a burst of machine gun fire. US military officials would not comment on what they termed an ongoing operation but said the reports were being checked. Concerns over security have been heightened as Shia Muslims mark the religious festival of Ashura, which in previous years has been hit by co-ordinated attacks. Some 10,000 Iraqi police and security forces have stepped up patrols in Karbala, where Shia pilgrims have been converging. Security has also been tightened along the 110km (70 miles) of highway from Baghdad to Karbala that runs through the Sunni areas, the French news agency AFP reports. Ashura draws huge numbers of Shias to Karbala from across Iraq and beyond its borders.